Amongst the myriad monuments and memorials that sprang up after WWI is the Bulimba Memorial Park on Oxford St at Bulimba. 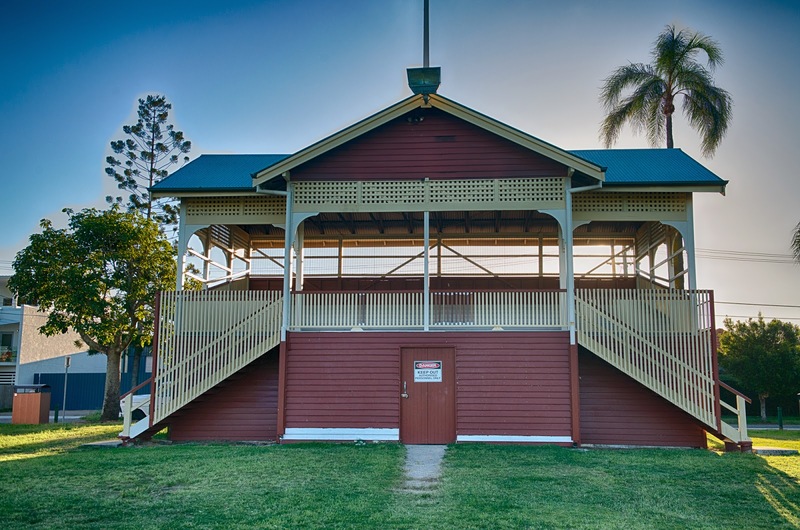 Originally a reserve known as Jamieson Park after an early land-owner of the district, it was opened as the Bulimba Soldiers and Sailors Memorial Park on 1 November 1919, dedicated to the servicemen and women of the suburb who went off to the Great War. The park has played host to many pastimes over the years since. Football teams of all types, cricket clubs, Girl Guides and Boy Scouts, even senior citizens from the area have all found a home here at various times. I played cricket in the park decades ago, and the verdant surrounds are still an attraction for all today. Here is a photograph of the park from 1949 that shows a cricket match in progress. The grandstand in the background of the image above was funded locally and constructed around 1923. I have a slight connection to the grandstand as it was built by a local tradesman who happened to be my great-grandfather, Fred Pool. 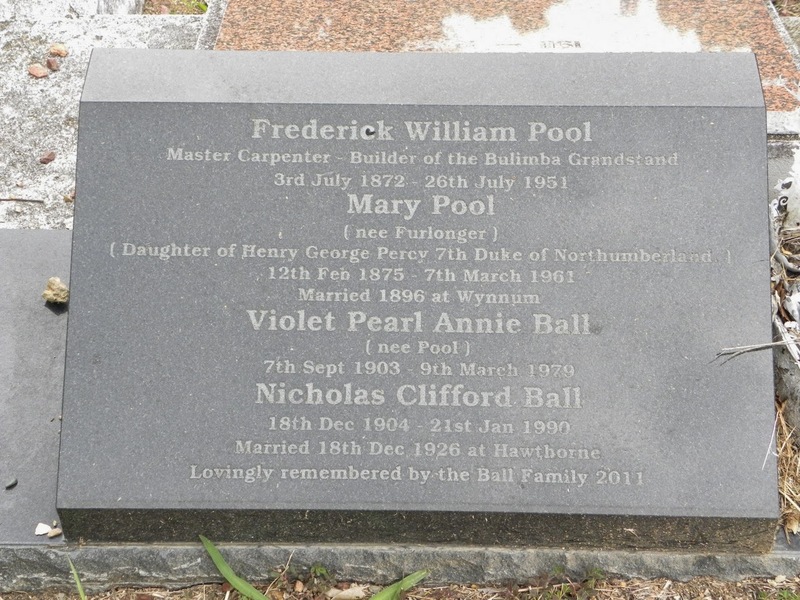 At the nearby Balmoral Cemetery is the headstone to Fred's grave that notes him as the builder of the grandstand. It was commissioned by my second cousin Barry as a tribute to his parents and grandparents. Master carpenter Fred lived nearby in Grosvenor St - he had one of the first motor cars in the area. He also built several houses in the district and from what I understand, he was a very busy man. Here is a picture of the grandstand taken a few years ago when it looked like it needed some TLC. 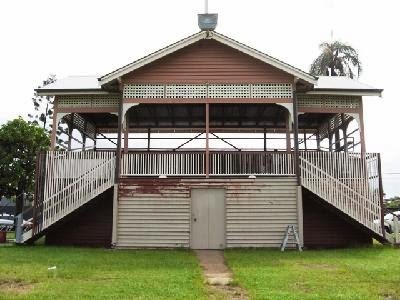 I imagine that the park and the grandstand are now looked after by the Brisbane City Council. Here is a recent photograph of the grandstand looking in much better condition. When I visited the park on a recent afternoon there were parents and children enjoying all aspects of the attractive area. Toddlers were playing on swings, there were a couple of scratch soccer games happening, kids were simply running because they can. I believe old Fred would be very pleased. Edit: The grandstand popped up on my television recently - it is the backdrop to a state government anti-smoking announcement. That park means a lot to me - I had my first kiss there! I also went to Girl Guides at the end of the park and attended many ANZAC Day dawn services there. This was also built by my Great Grandfather, my grandmother and grandfather his son lived in Grosvenor Street, and built the house they lived in. Remember it well. My mother was a Kitchen - I believe there is a family connection.